In February 1917 Russia suffered its first revolution of the year. On 2 March Tsar Nicholas abdicated. The following month, on the night of 16 April, the revolutionary Lenin arrived at the Finland Station in Petrograd from Switzerland, aboard a sealed train. The popularity of the Bolsheviks increased exponentially. The Provisional Government under Alexander Kerensky put the Romanovs under house arrest in the Alexander Palace at Tsarskoe Selo, 24 km (15 mi) south of Petrograd. In August, Nicholas and his family were evacuated to the Urals for their own safety. On 25 October 1917 Lenin led his Bolsheviks in an uprising against the Provisional Government. Many of the revolutionaries called for Nicholas to be put on trial. 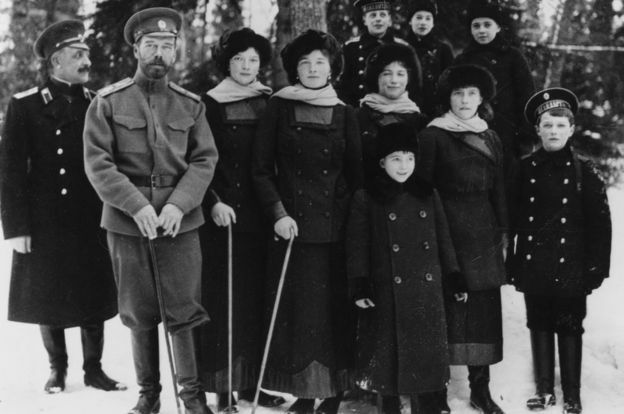 At 8.40am on 30 April 1918 the tsar and tsarina and their third daughter, Maria, arrived in Ekaterinburg and were taken to the 21-room home of retired local engineer, Nikolai N. Ipatiev, which had been commandeered by the Bolsheviks and renamed the House of Special Purpose. Five rooms on the upper floor were converted into a prison and the windows painted white to prevent anyone seeing in or out. The downstairs became offices and rooms for the guards. At 11am on 23 May the rest of the children arrived at Ekaterinburg. At 2.33am on 17 July, Nicholas, 50, Alexandra, 46, Alexei, the 13-year-old tsarevich, their four daughters, Olga, 22, Tatiana, 21, Maria, 19, and Anastasia, 17, their doctor, Yevgeny Botkin, 53, and three servants, footman Alexei Trupp, 60, cook Ivan Kharitonov, 46, and Anna Demidova, 40, Alexandra’s maid, were woken and taken into the basement. They were told that they would be moved and that they were to wait for cars. Nicholas, carrying the sleeping Alexei, asked for two chairs so that his wife and son could sit. The chairs were provided and then Yakov Yurovsky, a member of the secret police and the leader of the guards, returned with armed guards and told them, “Your relations have tried to save you. They have failed and now we must shoot you”. The family and servants were executed on the orders of Lenin. The tsar said, “You know not what you do,” before he was killed by a single shot to the head, while the tsarina had just time to make the sign of the cross before she too was felled by a single shot. No member of the immediate imperial family survived the night in the basement. On 27 July 1977 the Soviet authorities destroyed the Ipatiev house to stop it becoming a place of pilgrimage. Boris Yeltsin carried out the orders. In 1989 nine bodies, including those of the tsar and his family (apart from two children), were found buried outside Ekaterinburg. On 14 August 2000 the Romanov family was canonized as passion bearers by the synod of the Russian Orthodox Church.